Highlights from last week’s change management webinar with Cheryl Duvall. Image courtesy of Cheryl Duvall. On Tuesday, Cheryl Duvall, president of Avancé, and author of the recently published book, Change is on the Wind: Managing Change for a New Landscape, presented “Leading the Change Management Process from Resistance to Embrace”. She explained that even small-scale renovations may require a change management program if the change is perceived to be disruptive in the eyes of valued stakeholders. “Organizations are seeking–and demanding–change management programs to hand-hold them through bold cultural change so that their organizations embrace change rather than resist,” she said. To show how the eight steps have been adapted to support change initiatives, Duvall shared four stories from the field, isolating which steps helped each program to succeed. What made this project successful? 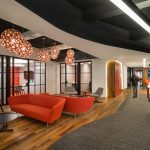 “The change management program for [this project] right now is focused on the upcoming relocation of their headquarters, involving 580 staff,” said Duvall. Their biggest pain point is having to transfer physical files to virtual, and decluttering and purging “stuff”. What is making this project successful? Let’s Help Amazon select HQ2! Thank you for the recap as I missed the webinar. A cautionary note from Kotter himself on trying to change organizations from within (Accelerate! HBR 2012), a range of other frameworks (see this list by Ron Leeman posted on LinkedIn) and a clear understanding (my blog post) of the outcomes and the reasons why, can not only address resistance but reduce the time needed to embrace change. 2015 will be the year of acceleration!